Vizio managed to achieve a careful balance between performance and affordability with their line of products, where among them include a new range of wireless High Definition audio devices that comprise of home theater surround sound systems alongside wireless subwoofers and wireless home theater headphones. We’re talking about the VHT200 2.0 HD Home Theater Sound bar here, where it ought to complement your 32″ LED TV with a similar 32″ long design that is slim. 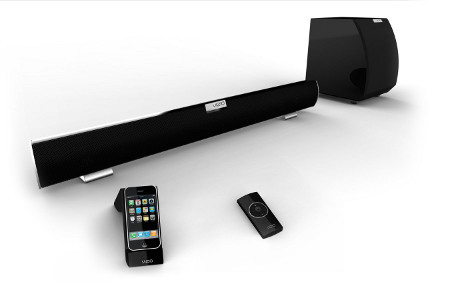 As for the VHT212 2.1 HD Home Theater Sound Bar, you also get a wireless subwoofer with it as well as an iPod dock that works in tandem with Vizio’s very own pair of wireless headphones for a truly connected experience (sans the risk of tripping over nasty wires in your home, of course). We’ll take a closer look at other devices from Vizio in the extended post. As for the VSB200 and VSB201 HD Home Theater Sound bars with Wireless Subwoofer sound bars, they have received an upgrade that enables the support of Dolby Digital audio alongside a brand new remote control to get you up and running in no time at all. The VHP100 Wireless Home Theater Headphones with iPod Dock is capable of delivering premium audio performance with active noise cancellation without causing your ears any discomfort or pain after hours of listening thanks to a special over-the-ear design. It is nice to know that every 2.1 and 5.1 home theater sound bars and wireless headphones will feature support for High Definition Wireless Audio (HDWA) that enables one to enjoy your home theater audio regardless of where you are in the home. Of course, this is subjected to how far you are away from the receiver, so if you happen to own a particularly large mansion, you might find some connectivity issues arising. Last but not least, the VHB100 Bluetooth Headphones works great with audio listening at home as well as communicating on your mobile device, hooking up via Bluetooth 2.0 connectivity while boasting optimized audio quality courtesy of SRS WOW HD and SRS CircleSurround.